Surging ahead in the title race, Arsenal hit Reading for six as Manchester City downed Brighton by the same margin. Elsewhere in the league, Liverpool and Bristol City grabbed narrow wins from home over West Ham and Yeovil Town as Birmingham City and Chelsea played out the only draw. Chelsea’s league form continues to stutter with yet another 0-0 draw. This time, it was the resolute defence of Birmingham City that helped stop Chelsea this time out. Chelsea had plenty of chances but it just didn’t seem to happen for them. Their best chance came from a penalty after a slightly controversial call considering Kerys Harrop had won the ball but she took Ji So-yun out in the same move. Yet the visitors drew a blank as a Ann-Katrin Berger produced a fine save to deny Karen Carney. Arsenal are gunning for the title and they followed on from thrashing current champions Chelsea to thrashing a normally resolute Reading team. It didn’t take long for the hosts to get their first of many with Vivianne Miedema adding to her impressive tally. Jordan Nobbs added another just a few minutes later and it looked like things could get ugly for the Royals quite quickly. Reading weren’t given much time on the ball with Arsenal pressing them when they managed to get possession. The Royals managed to hold on until just before half time with Beth Mead getting her name on the scoresheet with a great finish. In the second half, the goals came again with Miedema adding one not long after the restart. 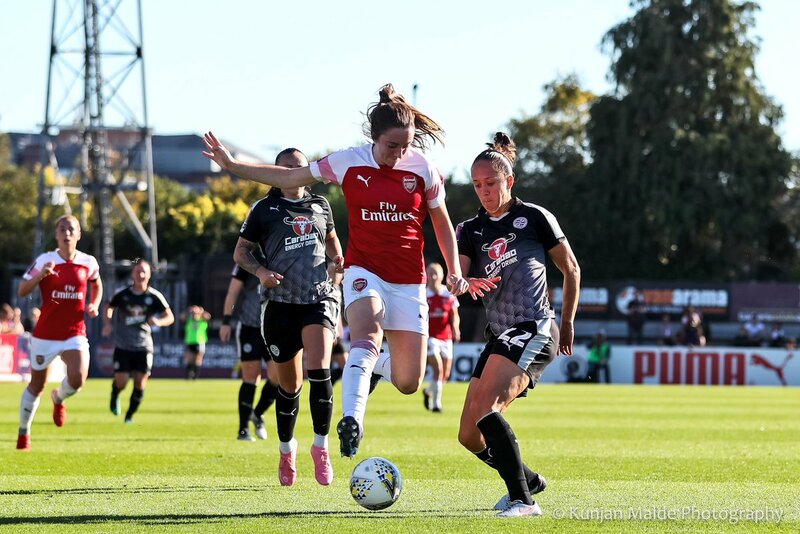 Danielle van de Donk also grabbed herself a goal and then Miedema completed her hat trick to top off another great win for the Gunners. "Any time you score, we can too," seemed to be what Manchester City thought on Sunday with Arsenal and City trading goals simultaneously on the day. Georgia Stanway was the star scorer as she netted a hat trick during the game. She broke the deadlock 21 minutes in and Caroline Weir doubled City’s lead in the first half. Stanway added the other two goals in quick succession in the second half then Claire Emslie and Nikita Parris wrapped proceedings up. West Ham are settling well into WSL life and Liverpool seem to be settling after the early shock departure of Neil Redfearn. Vicky Jepson and Chris Kirkland have steadied the ship and helped guide and manage the team to another win following on from last Sunday’s win against Yeovil. This was another close match with Courtney Sweetman-Kirk putting the Reds ahead in the eighth minute. Both teams had a fair amount of chances and Liverpool could have doubled their lead. Fran Kitching put in a great performance to deny the Hammers an equaliser, one of the best saves on the day was to deny her former Chelsea teammate Gilly Flaherty's header with a fingertip save. Rinsola Babajide almost added a second to seal the deal but Sweetman-Kirk’s goal was the difference on the day. The West Country derby is usually a match to look forward to and it didn't disappoint on Sunday. Whilst Yeovil have been finding the net, the results just haven’t come yet. Bristol opened the scoring half an hour through Lucy Graham but Yeovil responded instantly through Amber Gaylor. With the match finely poised, Yeovil could have almost taken the lead in the second half but Olivia Fergusson’s goal was disallowed after being ruled as offside. It was the Vixens who took the lead as Graham got her second.